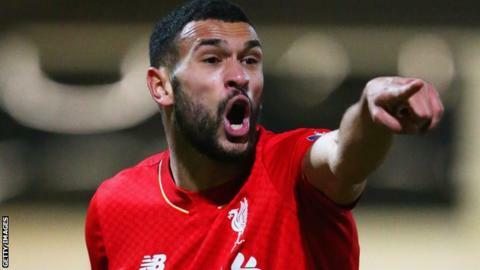 Dundee's new signing Steven Caulker was sold on a move to the Scottish Premiership following a telephone conversation with manager Neil McCann. The 26-year-old former England defender, who left Queens Park Rangers by mutual consent in December, has signed an 18-month deal. "I spoke with the manager, he gave me a call and I really liked the sound of him," Caulker told his club website. "I'm excited and looking forward to getting started." Caulker started at Spurs, with Cardiff paying £8m for him in 2013 before a switch to Loftus Road a year later. The former Tottenham and Cardiff player made the last of just four appearances this season for QPR in September. In season 2015-16, relegated QPR loaned the centre-half to Southampton, then Liverpool. Last year, he spoke to the Guardian about his struggles with depression, gambling and alcohol addiction. Caulker says he is relishing the prospect of playing football again and explained the background to his move. "It [the move] came about just a few days ago. I happened to be up here a few days ago for a funeral, so it was really bizarre how it happened. "I met him the night before and sat down to chat with him for about an hour. I just felt that he could offer me what I need and what I want. What I want is to be back enjoying my football in a good environment with a manager who is understanding, and one who is caring and respectful. "I feel that I've found that in Neil. I came up last night [Wednesday] and signed today. I'm excited and looking forward to getting started." Caulker, who trained with his new team-mates on Thursday, added: "It was good and nice to be back in amongst it. I've had six weeks out of football and had a little period at Luton which helped to tick me over. "Today was my first real session, with a shirt and a squad number and stuff. So it felt good and after a few more days training etc, I'll be ready to go. "I need to get my match fitness back but that shouldn't take too long. I've done enough in my period away from a club to keep in good shape - it's just a little bit of footwork etc that needs to be tidied up. "I'm confident that, with the manager and coaching staff, that we can get to that stage pretty quickly." Dundee said in a statement: "Steven trained with his new team-mates this morning and will wear squad number four." Caulker could make his debut in Saturday's Scottish Cup fifth-round encounter with Motherwell.